Releasing soon in India is a movie written by Swami Kriyananda, founder of Ananda. The Answer tells the powerful true story of an American James Donald Walters, his youthful quest for truth which took him from his birthplace in Romania, to Switzerland and England, as far as the United States, where in 1948 in Hollywood, California he has the extraordinary meeting with ParamhansaYogananda, the great Indian Master author of Autobiography of a Yogi. Young Donald – later Swami Kriyananda- is immediately accepted as disciple and so his amazing spiritual journey begins. This film is the saga of his anguished search, of his momentary illuminations and dark nights, of his determination to never give up, and of the winding path that leads him to the presence of his spiritual master. In his quest, we recognize the eternal search of every individual; through his inner battles, the discovery of our own inner strength; in his attunement with the expanded vision of his master, the hope for our own illuminations. 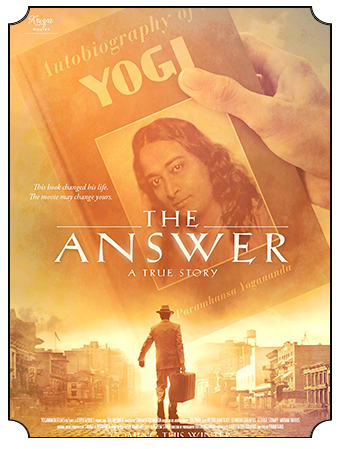 The Answer, is an epic motion picture that presents, for the first time on the cinematic screen, one of the most widely-known and revered spiritual Masters of our times, Paramhansa Yogananda, through the living testimony and in the own words of his direct disciple Swami Kriyananda who lived with him, and vowed to carry his light to future generations. The film is a period piece, set in the 1920’s through the 1950’s and is filmed across the U.S.A and Europe. Featuring an ensemble cast headed by Victor Banerjee (David Lean’s A passage to India) who essays the role of Yogananda, the movie is an unforgettable visual and emotional experience. it would have reached general public to rent or buy ! So if you dont know when it will be released please ask someone who does and tell us. I have been waiting for many years to see this film and I suspect that quite many souls are waiting too ! Hi, is it possible to buy the movie (DVD) somewhere online? I am in NZ – Auckland and would like to watch The Answer 2018 how can I do this.